For able-bodied people, the thought of being injured by lying in bed can seem hard to imagine. 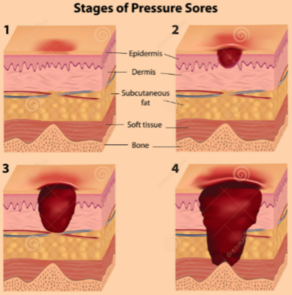 But bedsores, also called pressure ulcers or decubitus ulcers, are serious and all too common. Bedsores are injuries to the skin and underlying tissue caused by the prolonged pressure of being unable to move. This prolonged pressure occurs when a person is confined to a bed or chair due to illness or injury. The patient�s body weight presses the skin against the firm surface of a bed or chair, cutting off blood supply and literally causing the skin cells to die. Unless the pressure is relieved and blood flow returned, the skin develops ulcers. At first, the skin shows redness. Without relief, that redness progresses to blisters, followed by open sores. In severe cases, the damage can extend through the skin, creating deep craters that expose muscle or even bone. We can�t stress it enough: bedsores are serious. In the United States, approximately 9% of all hospitalized patients will develop bedsores at some point. An estimated 3%-14% of home care patients will struggle with bedsores, as well as 3%-12% of nursing home residents. Patients transferred from hospitals to nursing homes are particularly vulnerable, with 10%-35% reported to suffer from this terrible condition. Deceptively, it doesn�t take much pressure to create bedsores. Pressure of less than 25% the pressure of human weight on a normal mattress can lead to bedsores. The normal movement (even in our sleep) of able-bodied people is enough to prevent bedsores. Patients confined to beds or chairs aren�t so lucky. Shearing and friction: Shearing and friction occur whenever two surfaces move laterally in relation to each other� like skin against a mattress. This causes skin to stretch and blood vessels to kink, impairing circulation. In a person confined to bed, shearing and friction can occur when the patient is dragged or slid across the sheets. It can also occur when the head of the bed is raised more than 30 degrees, increasing shearing forces over the lower back and tailbone. Moisture: Wetness from perspiration, urine or feces can soften skin excessively, making it more likely to be injured by pressure. For this reason, incontinent patients unable to control their bladders or bowels are at high risk of developing bedsores. Decreased Sensation: Bedsores are more common in patients with spinal cord injuries or other neurological problems that decrease their ability to feel pain or discomfort. Without the warning signs of pain, the patient cannot feel the effects of prolonged pressure on the skin, leaving the problem unaddressed. Circulatory Problems: People with atherosclerosis, circulatory problems from long-term diabetes, or localized swelling (edema) may be more likely to develop bedsores. This is because the blood flow in their skin is already decreased, exacerbating the effects of pressure. Anemic patients are also at risk, because their blood cannot carry enough oxygen to skin cells despite otherwise normal circulation. Age: Elderly patients, especially those over 85, are more likely to develop bedsores since skin becomes thinner with age. Also, as we age, fat tends to shift away from the body surface, where it acts as a cushion, to deeper areas of the body. Stage I (earliest signs of skin damage) � White or light-skinned patients develop patches of red skin that does not turn white when you press it with your finger. In people with darker skin, the patch may be red, purple, or blue and may be more difficult to detect. The skin may be tender or itchy, and may feel either warm or cold and firm. Stage II � The injured skin blisters or develops an open sore or abrasion. The sore does does not extend through the full thickness of the skin. There may be a surrounding area of red or purple discoloration, mild swelling and some oozing. Stage III � The ulcer becomes a crater that goes below the skin surface. Stage IV � The crater deepens and reaches into muscle, bone, tendon or joint. Because broken skin is a prime spot for bacteria, bedsores are extremely vulnerable to infection. It is imperative that patients with restricted movement prevent and treat bedsores. Fortunately, alternating pressure mattresses are specifically designed to relieve the pressure that causes bedsores, allowing patients to heal and thrive. For more information or to discuss our treatment options, feel free to call us at 1-800-725-9230.